On 31 December 2018 the partnership between Mercedes-Benz and the German Football Association (DFB) comes to an end. In today's Germany – Netherlands international, the brand with the star is making its last appearance as the general sponsor of the DFB. As it bids farewell, Mercedes-Benz thanks its long-term partner for the trusting cooperation. The end of an era: after 46 years together, Mercedes-Benz and the DFB will be going their separate ways from 2019 when it comes to sports sponsorship. At today's Germany – Netherlands game at the Veltins Arena in Gelsenkirchen, THE TEAM is playing under the star for the last time. Dieter Zetsche, Chairman of the Board of Management of Daimler AG: "During our decades-long partnership, German football has achieved extraordinary things. It was fantastic to be part of it with Mercedes-Benz! And this finale now gives us an opportunity to explore new avenues. But one thing won't change: we remain passionate fans of the national team." To mark the last joint international, Mercedes-Benz is bidding farewell with an ad titled "The journey", recounting the many memories of the last 46 years via an emotional journey through Germany's football landscape. The team bus drives through the nation one last time – from the coastal region through the major cities down to the alpine roads – and recalls the last five decades together. The creative agency antoni has produced the 60-seconder, which will be broadcast on TV ahead of the international against the Netherlands. The ad will then be available for viewing online on various Mercedes-Benz channels. The joint success story started in 1972. German football was playing under a particularly auspicious star back then: for the first time Germany won the European Championship, and the German Football Association and Mercedes-Benz started working together on the basis of a partnership. The collaboration was significantly extended as part of the 1990 World Cup, and Mercedes-Benz has been a general sponsor of the German Football Association ever since. At the premium vehicle manufacturer's side, the national men's team won the World Cup three times (1974, 1990, 2014), the women's team won it twice (2003 and 2007). The German Football Association's men also won the European Championship title three times (1972, 1980 and 1996), and the women were victorious no less than eight times (1989, 1991, 1995, 1997, 2001, 2005, 2009, 2013). Since 1990 the partners have made joint appearances at a total of eight World Championships, seven European Championships, 395 men's internationals and 415 women's internationals. As part of this cooperation, Mercedes-Benz provided special support for the German Football Association's men's and women's national teams. 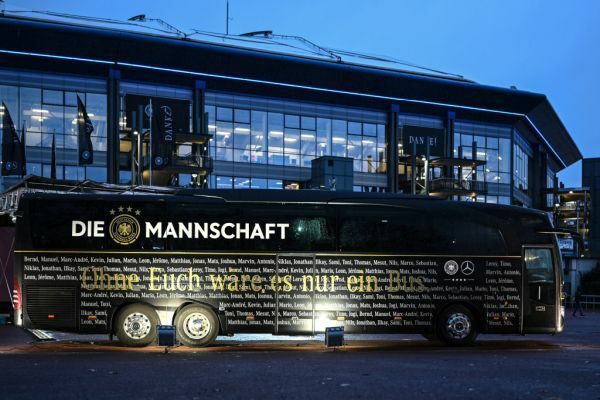 The teams and their coaches had Mercedes-Benz Travego and Tourismo buses at their disposal for travel to internationals and training sessions. There was also a driver service for travel to internationals. Football shirts and leisure clothing of the national players and their coaching staff bore the logo and lettering of the premium brand. 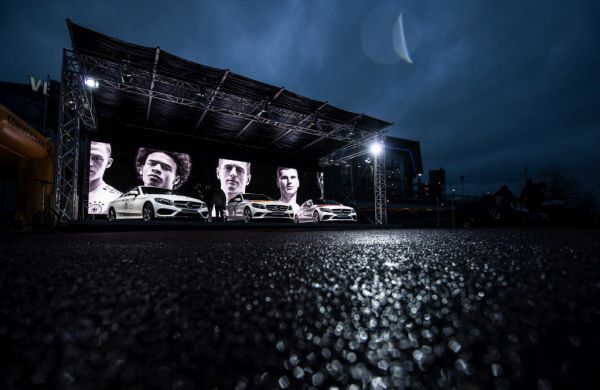 Mercedes-Benz supported the German Football Association with large-scale campaigns at World and European Championships. The first joint campaign, "Alpine adventure", to mark the European Championship in 2008 in Austria and Switzerland, is one of the memorable highlights. The multi-award-winning "Ready as never before" campaign for the 2014 World Cup made a lasting impression with its emphasis on digital distribution. It was also possible to call up campaign content via the Mercedes-Benz football channels on Facebook, YouTube, tumblr, Instagram, Twitter and g+. Two Facebook apps completed the digital offering. A highlight of "Ready as never before" which drew lots of attention was the journey taken by the new World Champions on the Berlin fan mile to the Brandenburg Gate in the Mercedes-Benz victory truck converted to a stage on wheels. Mercedes-Benz won a number of awards for the entire campaign, including Sponsor of the Year 2014 from the specialist journal Horizont. In the same year the company was also given the International Sponsoring Award by the specialist association Faspo. The brand with the star founded the Mercedes-Benz Sports Press Club for journalists in 1992. This format offered the sporting press a forum for cross-media dialogue at home internationals. The company also helped up-and-coming players by supporting the U 19 and U 21 teams. Mercedes-Benz has also been committed to sports projects with a community and social impact. One example is the Integration Prize which Mercedes-Benz and the German Football Association initiated in 2007. The award honours sports projects which foster the integration of young people from a migrant background through football. Cooperation with the German Football Association has given Mercedes-Benz the perfect framework for presenting the premium brand in top-level international sport over many years. For the first time, the German Football Association put the automotive partnership out to tender in 2018, and Mercedes-Benz participated in the process. However, differing views regarding activities and financial framework terms have led to Mercedes-Benz and the German Football Association going their separate ways in sports sponsoring as of 2019. Mercedes-Benz will now concentrate on its commitment to other disciplines in top-level international sport. The focus is on promoting motorsport, golf, equestrian sport, triathlon and mountain biking. In addition to this, Mercedes-Benz is the Global Sponsor of the Laver Cup, a top event in international tennis, and the Title Sponsor of the MercedesCup in Stuttgart. Furthermore the company presents the Mercedes-Benz JuniorCup, one of the world’s most important youth football tournaments.The brand is also committed to new types of trend sports of a digital nature like eSports, it supports German Sports Aid and promotes the charitable Laureus Foundation.